After another 7% drop today, Urban Outfitters (URBN) stock has now dropped nearly 20% in the last two days. Urban Outfitters Inc. (Nasdaq: URBN) shares fell to a 52-week low of $19.26 Tuesday morning following head-scratching news from the specialty retailer. Urban Outfitters announced Monday it has acquired Philadelphia's Vetri Family group of restaurants, including the Pizzeria Vetri chain. 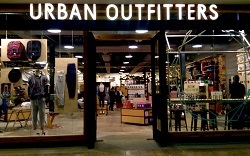 Urban Outfitters (URBN) stock immediately slipped 7.4% on the news. Financial terms of the Vetri deal weren't disclosed, and Urban Outfitters didn't elaborate on how and where it plans to integrate the restaurants with its stores. Buying a restaurant chain was a strange move for the national retailer, which boasts some 240 stores. But it does have some experience in the space. The company operates three locations that combine retail, dining, artists' collaborations, music, and events into one place. Called Urban Outfitter Spaces, the three locations are in Brooklyn, Austin, and Los Angeles. Cafes are also attached to some of Urban Outfitters' larger stores. "Spending on casual dining is expanding rapidly, and thus, we believe there is tremendous opportunity to expand the Pizzeria Vetri concept," Urban Outfitters CEO Richard Hayne said in a statement Monday. "Investors are concerned about the (retail) sector as a whole," Simeon Siegel of Nomura Securities told Bloomberg. "Anything that's going to give credibility to the fear that the old-school retail model is antiquated is going to trigger more fear." By expanding into dining, Urban Outfitters actually put a bigger spotlight on its existing business, Siegel said. In shifting direction, investors want answers about the value of Urban Outfitters' core retail business before they start digesting the new restaurant business. The dining option isn't the only way Urban Outfitters has recently diversified its operations. New brands include a gardening-focused subsidiary named Terrain and a wedding brand called BHLDN.